It’s been three days since we completed our SUP road trip after two months of travel. Since I last wrote we departed Hood River, I raced in 30+ mph winds in Seattle, we made our way down the Pacific Coast Highway to Southern California and rounded out the trip with the Pacific Paddle Games last weekend. It’s been quite a busy few weeks! Leaving Hood River was tough as it is such an amazing and fun town. As I said in previous posts, put Hood River and the Columbia River Gorge at the top of your list for paddling destinations. With Hood River in the rear view I set my sights on Seattle and the Round the Rock race on Lake Washington. 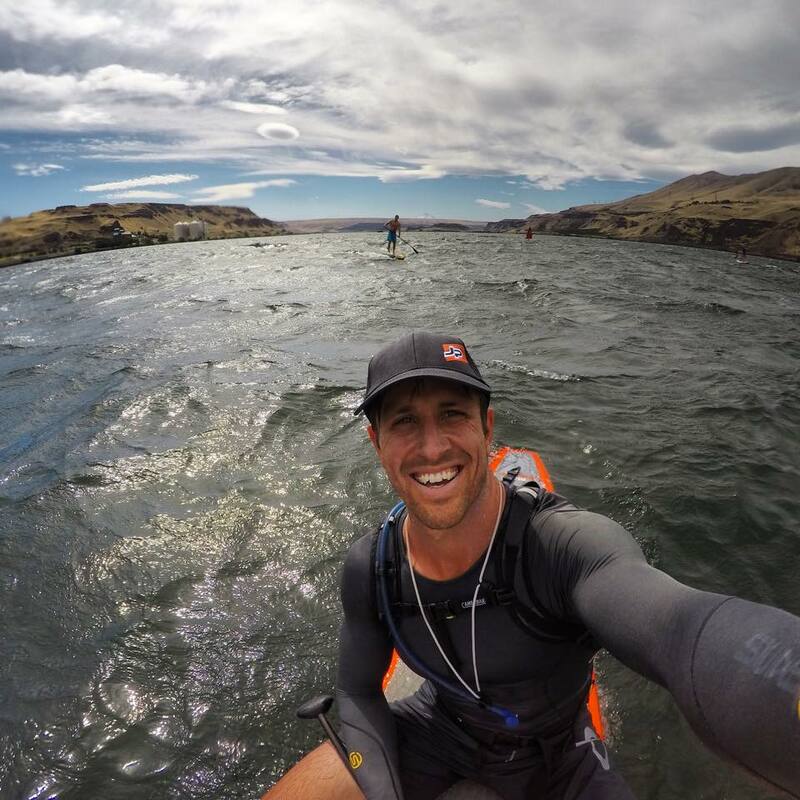 It’s easy to smile when paddling in the Columbia River Gorge. Race morning came and the forecast was for strong winds and rain, not the best paddling weather but gave the whole day a very Pacific Northwesterly feel. I drove to the race site in a light rain with 10-15 mph winds and grey skies. 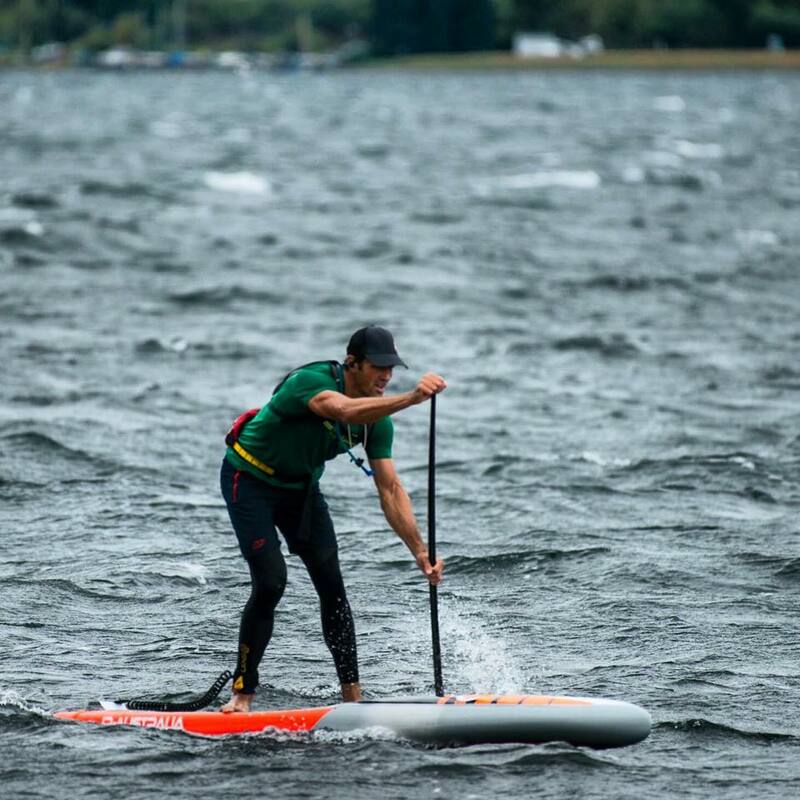 Despite the adverse conditions, over 100 smiling and stoked paddlers were ready to race the 13-mile course around Mercer Island. The Round the Rock has a unique ‘sweep or weep’ format where a paddler racing a smaller board class can take the prize money of a larger board class if they finish ahead of them. This made for an interesting dilemma in my board choice decision. Do I get greedy and race 12’6 and try to beat all 14 and unlimited paddlers? My plan could backfire and I may simply suffer more by racing a slower board and not beat any faster board classes. I told myself, “what the heck”, and went for it. The whole reason they even have the unique format is for smaller classes to try to “sweep” the field. If there was any race to do it at it was one with adverse conditions. Wind and chop would help narrow the advantage that bigger, faster boards normally enjoy. With my decision to race 12’6 made, the horn sounded and we were paddling straight upwind into 15-18 mph winds. The start conditions were not too strenuous but not exactly easy either. After about 3-miles of paddling upwind, with the wind steadily increasing to a consistent 20+, we rounded the windward side of the island and began paddling downwind. My decision to race 12’6 seemed to be working out so far with Dan Gavere on a 14’ right next to me and Beau Whitehead on an unlimited on my other side. It looked like it would be a battle between each board class on the downwind leg of the race. I have not paddled much on Lake Washington but I’m sure that downwinders don’t get much better there than they were that day. The wind was now gusting over 30 mph and we were catching fun knee high bumps for a little over 4 miles. By the end of the downwinder I had slowly gained a lead over the other two paddlers. We soon rounded the leeward end of the island and began our slow grind back upwind. Great downwind paddling on Lake Washington. Too bad we had to paddle back upwind! To say that this last section of the race was difficult would be a gross understatement. Over half of the field that started the race pulled out in this last section. I rounded the island and was greeted with wind gusts over 35 mph. There was still a significant amount of ground to cover and I began to wonder what I was doing in what felt like nearly tropical storm level conditions. It’s the first time I’ve literally gone backwards during a SUP race. The last mile was the fiercest and most grueling as the course left us fully exposed to the elements with 35 + mph gusts and thigh to waist high chop. 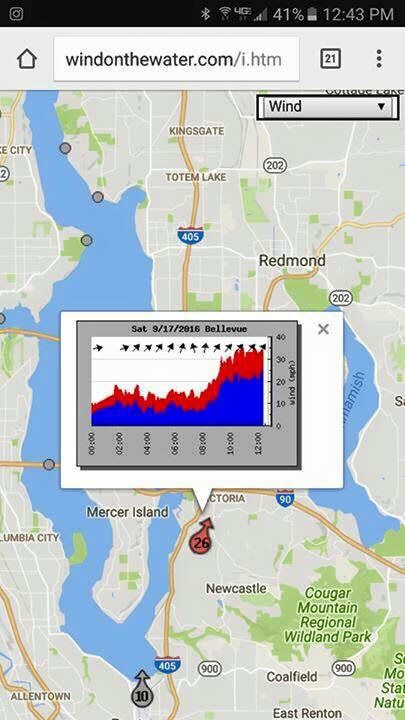 Lake Washington wind graph from race day. In the end I managed to survive the insane conditions and finish first on my 12’6. Anyone who participated in this years Round the Rock race should be proud to even have hit the water that day, much less finish the course. The race organizers did a great job of putting on the event despite the inclement weather. I’ll be sure to be back again, although I won’t complain if it’s without all of the Pacific Northwesterlyness next time. After Seattle we were ready to head south and in the direction of home in San Diego. Our route took us to the southern Oregon coast and along the Pacific Coast Highway most of the way back to southern California. Our first stop was Dunes City and the Oregon Dunes National Recreation Area. We stayed in the perfect stand up paddle home base cabin at Darlings Marina on Siltcoos Lake. I didn’t know when I booked the cabin, but Siltcoos Lake connects to the Siltcoos River which then dumps into the Pacific Ocean. The Siltcoos River and lake are popular canoe paddling destinations and will surely become popular with stand up paddlers. I set off on a paddling adventure straight from our cabin and paddled 4 miles to the Pacific Ocean through old growth forest and massive sand dunes. The paddle starts off in Siltcoos Lake and proceeds 3 miles down the winding Siltcoos River. Beautiful trees and massive sand dunes greet you around every corner. The reward at the end is the mighty Pacific with miles of undeveloped beach and dunes as far as you can see. 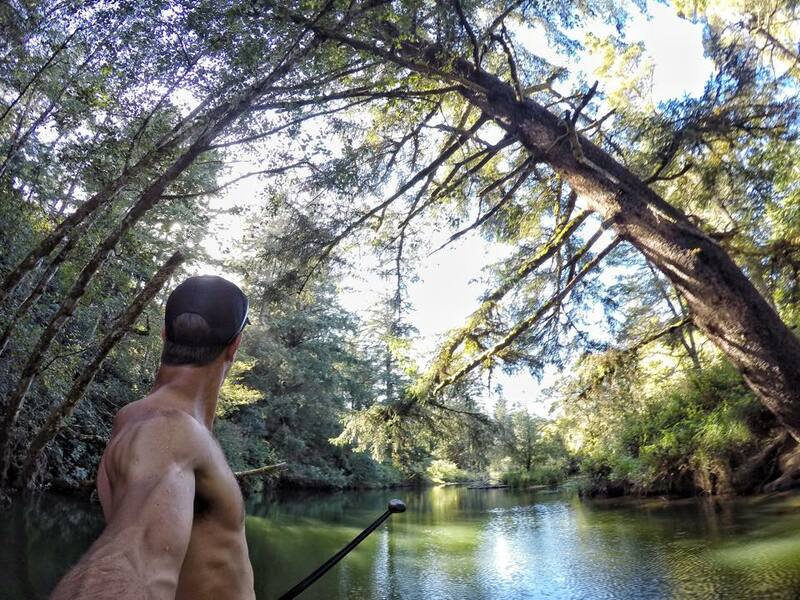 The Siltcoos River paddle was a nice surprise that renewed my love for exploration and adventure on board a SUP. From the Oregon coast sand dunes our next stop was Crecent City, California and the Jedediah Smith Redwood Forest. Hiking through the massive trees, some over 300 ft tall and 50 ft in diameter, can certainly make you feel insignificant. I didn’t have time but there is another great exploration paddle opportunity on the Smith River which intersects the redwood forest. I’ll put that one on the bucket list for the next SUP road trip through northern California! After Crecent City we powered through 8 hours of driving and spent the night at the start of the Big Sur section of the Pacific Coast Highway. Big Sur is the quintessential California road visited by travelers from around the world. The PCH clings to massive cliffs for around 60 miles as it winds it’s way above the Pacific Ocean. There are a few places to paddle along the coast but most of the way is inaccessible with rocky cliffs and no beach access. We stopped for a picnic on the southern end of Big Sur at Sand Dollar beach. The waves were pumping and the sun was out but I would have to only watch as Stella was not in the mood for an extended surf session. We needed to head south to our next stop in Morro Bay. This was yet another jarring instance where I realized that being a new dad comes with a lot of joy, and a lot of sacrifice. 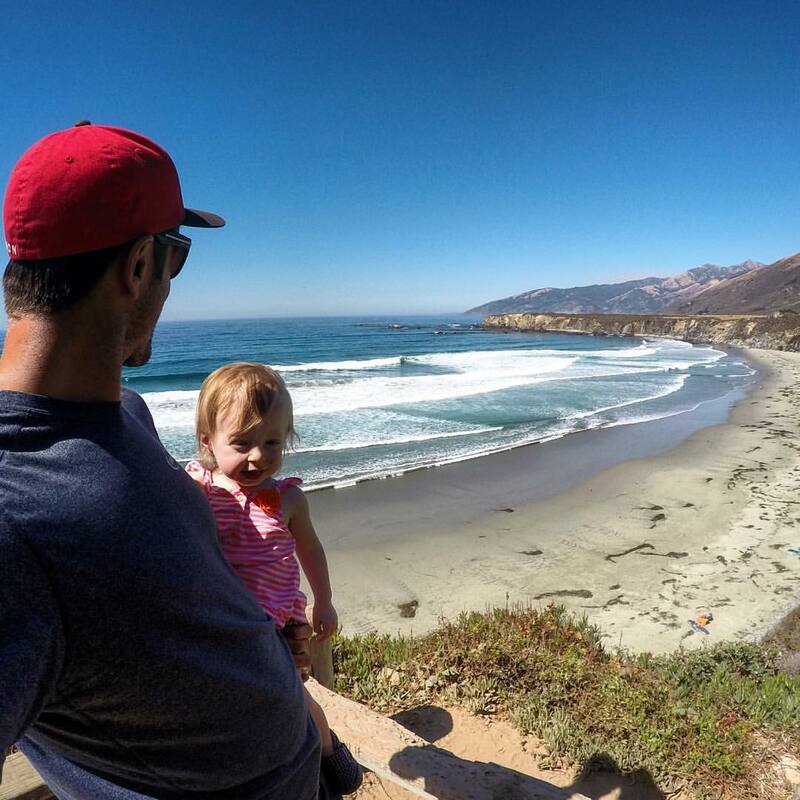 Skipping a perfect opportunity for a quick surf session in a beautiful uncrowded lineup is what good dads do. At least that’s what I told myself as I mind-surfed the perfect beach break. Morro Bay on the central California coast is another gem of a paddling destination. The bay offers perfectly flat water and plenty of amazing wildlife with sea otters, birds and sea lions in abundance. The otters were especially cool to see as they are not found easily in many other places along the coast. After Morro Bay we were off to Dana Point for my last event of the SUP race season, the Pacific Paddle Games. The PPG’s replaced the BOP two years ago and has become the biggest event for elite paddlers from around the world. The level of racing did not disappoint with virtually every top paddler in the world in attendance. In every race I’ve ever done I would not be too happy with a 26th place finish. I’m not exactly thrilled, but I paddled as good as I could and finished 26th in the distance and made the quarterfinals of the beach tech race. A few falls on too narrow of a board did not help my cause but in the end the level was incredibly strong. A busy few days of racing rounded out our epic road trip. We packed up and made one more final drive home to San Diego. 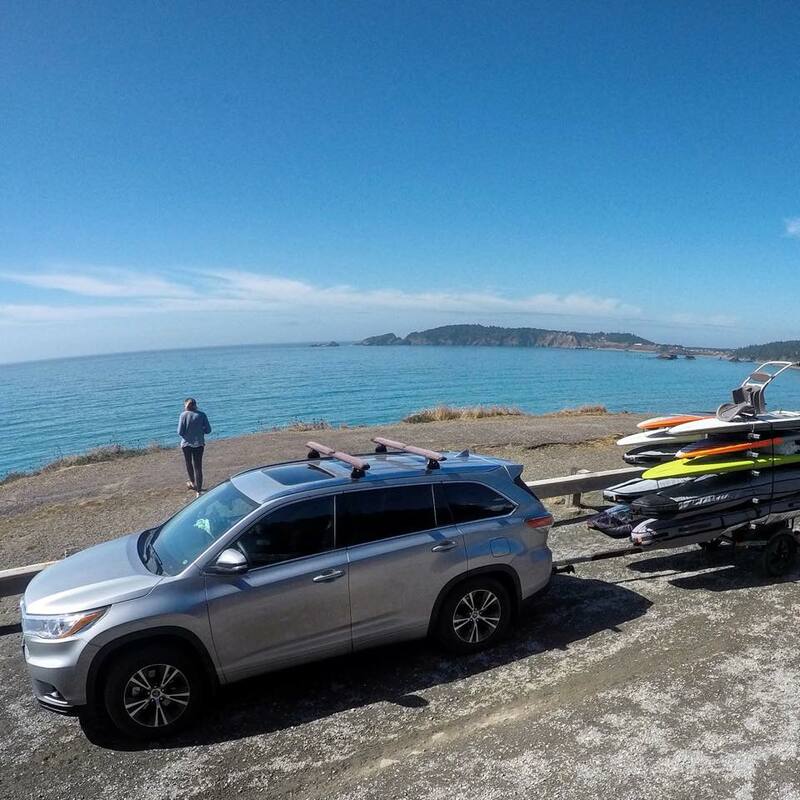 Stopping to take in the view along the Oregon coast with our Sportsrig and JP Australia boards in tow. After two months on the road we made it home and it feels so good to sleep in our own bed! We had an amazing time in Yosemite, Tahoe, Hood River, Seattle and the Oregon and California coasts. I feel so fortunate to see and experience these areas with my family and I’m happy to share the journey with you. I hope you enjoyed reading about our adventures and I’ll be sure to write again during our next SUP road trip!